Congratulations! 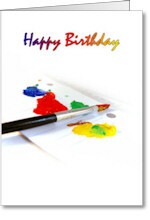 You've taken the first step to becoming a greeting card artist. Artists find GCU to be a very rewarding place to showcase their work. Once their cards are online and getting noticed, sales tend to be steady and grow over time, adding to the fun. Will you make a lot of money? - No, at least not for a while. But you likely will make sales, and sales do tend to grow as your cards get noticed and as GCU grows. New artists get very excited to see their cards being viewed and purchased from shoppers all over the world. Our top artists have been here since late 2006 and many have built up a showcase of 1000s of designs. What should be important to you initially is to take advantage of the opportunity to showcase your work and to add to the ever-increasing library of great cards at GCU. Our artists help each other through discussions on the Forum, and they collaborate together, rather than compete, to assure they all succeed and have fun. Most artists are very anxious to get started and they just jump right. DON'T! It is very important to thoroughly read these Get Started pages FULLY so that you don't get frustrated and give up. The GCU site works very well, but like many sites, it may not behave the way you might think it should as you "click around." If you follow normal steps, things work very smoothly. It will take some time to learn some of the key procedural steps to create, edit, and manage your cards. What should you do first? - Navigate the site. The GCU Home Page gives you access to most areas you'll need to know about. In the top header area are quick links for both artists and card buyers. As an artist you'll use the Manage Store and Forum links the most. Artists as well as card buyers also use the Order History and My Favorite Cards links access recent activity. The shopping cart is always available in the upper right corner no matter which page you are on at GCU.